Ondre Odain struck a hat-trick for Limetree in the PFA Sunday Senior Cup Final. 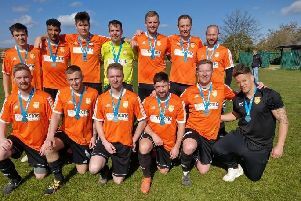 Ondrea Odain bagged a hat-trick as hot favourites Limetree lifted the PFA Sunday Senior Cup at Yaxley FC (April 7). The powerful striker struck with a header after just three minutes and added a second on the stroke of half-time after Dan Drane had also scored against lower division opponents Thorpe Wood Rangers. Limetree's Jake Sansby was man-of-the-match in the PFA Sunday Junior Cup Final. The underdogs rallied strongly after the break though, forcing Limetree ‘keeper Lea Jordan to make a couple of terrific saves before Nathan Smith did pull a goal back on 55 minutes with a fierce drive. But a tap-in almost immediately for Odain ended all thoughts of a comeback and Jakes Sansby completed the scoring with a fine individual goal. Sansby claimed the man-of-the-match award for his wizard wingplay as he showcased all his showboating skills.